Love is in the air with Woodland Friends Happy Valentine's Day Decorations! Each cardstock cutout is printed on both sides with cuddly critters like owls, skunks, and foxes holding valentines. Tape them to windows and walls or simply place them around the room to fill your home with love. Includes:8 small cutouts, 7in tall; 3 medium cutouts, 9in tall; Large cutout, 7 1/2in wide x 11in tall. Each cardstock letter features an adorable woodland critter holding a valentine. These single-sided cutouts are covered in polka dot, heart, and chevron prints. Hang it up for a cute addition to your Valentine's Day decor! Item details: 11ft wide x 12in tall; 15 cutouts; Cardstock material printed single side. VALENTINE'S CLASSROOM DECORATIONS: Hang up these cute woodland creatures with hearts to celebrate Valentine's Day! 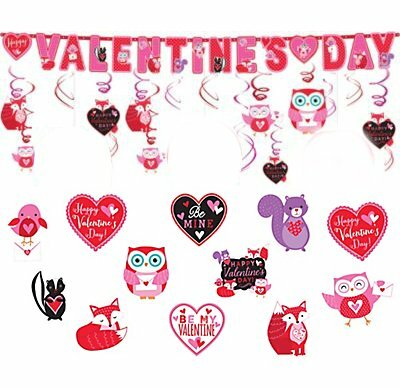 SET INCLUDES: 12 Woodland Creature Hanging Swirls (with attached plastic hooks), 12 Woodland Creature Cutouts, and Happy Valentine's Day Banner (11 feet long). CUTE WOODLAND CREATURES: Kids will love these adorable happy Valentine animals, such as a fox, owl, squirrel, and even a skunk! QUALITY COLOR PRINT: Images on the Swirls & Cutouts are printed on both sides; Banner is printed on one side. 100% SATISFACTION GUARANTEE: Backed by a no-questions-asked, 100% satisfaction guarantee. Try today for a risk-free party experience! If you have any questions about this product by Live It Up! Party SuppliesTM, contact us by completing and submitting the form below. If you are looking for a specif part number, please include it with your message.